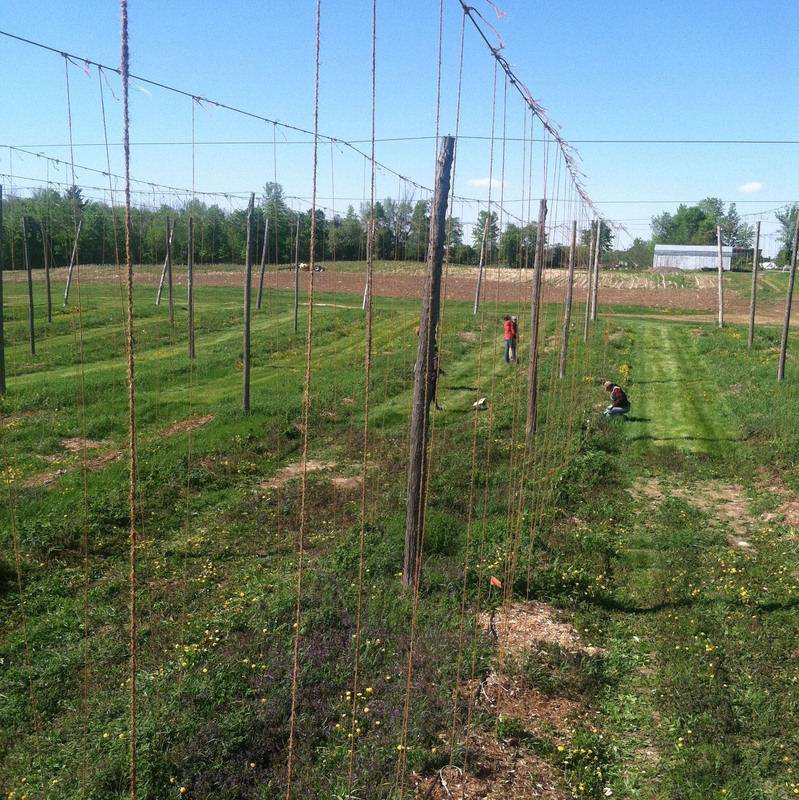 In commercial hop yards, different cultivars are trained on specific dates in the spring. Depending on whether a cultivar matures early, mid-season, or late, there is typically a particular range of days for those plants to start their upward growth. Getting the bines off the ground is also important for managing downy mildew. 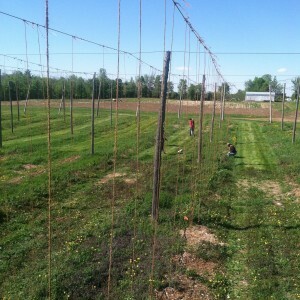 Training hops at Borderview Research Farm. Training dates have not been formally identified for the Northeast region. We trained our hops at the Borderview Research Farm in Alburg this week (Tuesday, 5/26) while some other hop growers reported that they completed their training on 5/19. We recommend that you make your own observations of hop maturity and write down when you trained each hop cultivar (down the road, we hope to have funds to conduct in-depth research on this important topic). When training, each string should have 3 or 4 bines. The bines should be trained clockwise as the plants grow towards the sun over the course of each day, winding themselves up the string. Remember that hop plants can grow 1 foot per day–that’s 6 inches before lunch! Because some varieties mature a little slower than others, our crew will make another sweep around the hop yard to train any later maturing plants in about a week. At this time of year, it is also critical to irrigate and fertilize. More on that topic coming soon. Until then, stay calm and hop on. This entry was posted on Friday, May 29th, 2015 at 3:52 pm and is filed under What's Hoppening. You can follow any responses to this entry through the RSS 2.0 feed. You can leave a response, or trackback from your own site.